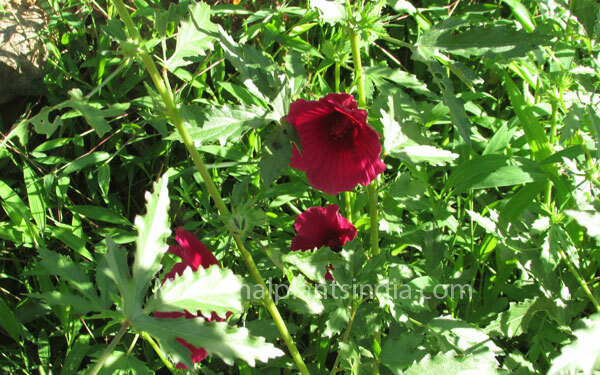 The scientific name of Deccan Hemp: Hibiscus cannabinus L.
Deccan Hemp belongs to Hibiscus family, an annual herbaceous plant, woody, grew up to 3.5 m tall, stem are 1 to 2 cm diameter in size. It is often multy branched. The leaves are up to 15 cm long, hairy or little spiny variable in shape, near the base deeply lobed with 3 to 7 lobes. The flowers are white to purple, 8 to 15 cm diameter. The fruit is a capsule, about 2 cm diameter, containing many seeds. Useful plant parts: Leaves and flowers. To treat biliousness with acidity, poultice on pains and bruises, dysentery, throat disorders, anaemia, fatigue, lassitude, etc. The chemical content: polysaccharides, dextrin, pectin, tannin, protein.